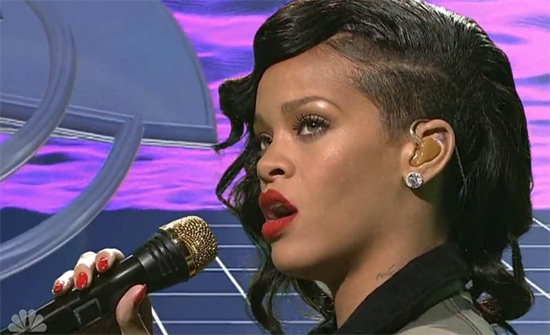 Rihanna is back on the album promo trail- yes, she has another album out about a year after the last- and touched down on the set of Saturday Night Live to showcase two tracks from the November 19th released Unapologetic. First up was new single Diamonds, which was accompanied by some weird animated background that initially had me worried was a ploy by directors to distract us from the potentially damaging vocal that was to come. But it wasn't that bad. Honestly. I've been really interested in hearing Rihanna sing Diamonds live ever since the song debuted in September. With the sustained belting being quite extensive throughout, I did wonder if the Barbadian beauty was going to be able to maintain the stamina - let alone hit the notes- when it eventually came to performing live. The reality is Rihanna kind of copped out when showtime came around, relying on a heavy backing track to cover a lot of the notes I wanted to hear tackled live. Her tone was great though, and her control of her lower range, as well as her timbre, was much improved. Also I was really surprised that she managed the fifth octave run at the end of the Diamonds. Overall, it wasn't the most assured performance, Rihanna seemed introverted and nervous throughout, but it wasn't the car crash I was expecting. The second performance was of the totally new song Stay and was something altogether more accomplished and dare I say, impressive. Rihanna looked and sounded more comfortable from the outset; which isn't surprising considering the song was well within her range, only featuring one big note in the form of a brilliantly executed A4 at 3.27. The payoff from not having to worry about hitting tricky notes meant Rihanna could focus on the emotion of the piano driven ballad, and as a result she managed to set the tone brilliantly with her delivery. It's the first time that I've genuinely been affected by a Rihanna vocal. I wasn't crying or anything, but it moved me more than any previous live (or recorded) vocal from the singer. Though this wasn't a bad showing by Rihanna it's actually made me less bothered about the release of Unapologetic. Perhaps I'm finally started to suffer from that Rihanna fatigue some of you began feeling about 3 albums back. Rihanna surprised me...in a good way...Her vocal weight control has gotten better, but her vocal placement was still questionable at some parts of "Diamonds".I'm impressed, I sayed it DD....For someone who absolutely hates Rihanna (this guy) I'm impressed. I miss the whole "Umbrella" vibe. I will never be converted! NEVER! I really, really think that this song is the worst song Rihanna's ever done. Diamonds, I mean. Hahaha. I'd sooner convert to christianity than to Rhianna. Even just seeing the pictures above makes me want to hug Chris Brown. THAT is how deeply I loathe her. Hahaha I don't hate her that much. I have nothing against those who are religious, but religion is definitely not for me. I'd rather purchase her entire discography than step foot in a church hahaha. LOL both Chris and Rihanna are vile and deserve one another. It's just that as a belief system I find Islam to be the vilest ( good word for it) of the religious ones. hahahaha I have to agree that some churches as well as synagogues are quite beautiful pieces of architecture. Are you a fan of Rihanna, DD? The way you talk about her vocal ability and scraping what little notes you can find (that aren't even impressive anyway) to form a praise baffles me, especially when you are often so harsh on much better singers! Wow, that wasn't nearly as bad as I thought it would be. Also, I have to be the only person on this blog who actually likes this song! her debut, is hard on the voice. Rated R was her best album, she sings only sh*t these days ! Lol please do, I just about shat my insides out reading your comment, hilarious! Cut her sum slack. She's improved let's not criticize her on our own personal views. Yep! And like i've said before, I don't judge singers against some lofty ideals of what a great vocalist is. I tend to judge them against like, and most often, against their own studio output. Hahahaha she was, but I try not to take these things so seriously anymore. I simply use internet for that purpose, and take the most up-to-date news.